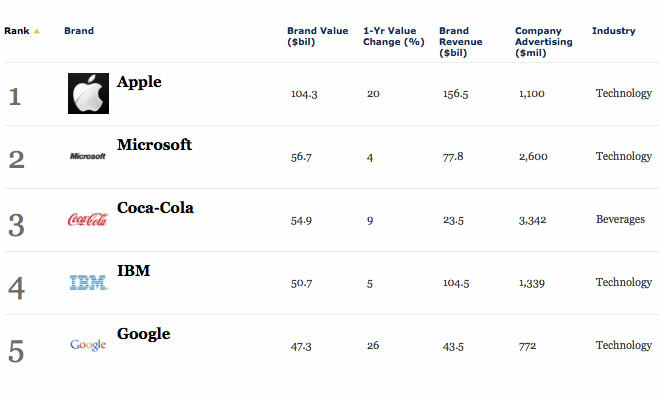 With a calculated brand value nearly twice that of the nearest competitor, Apple once again finds itself at the peak of an annual ranking of the world's most valuable brands. Apple is joined by fellow technology giants Microsoft, IBM, Google, Intel, and Samsung in the top ten of the once-yearly Forbes rankings, with non-tech brands McDonald's, General Electric, and Louis Vuitton rounding out the group. Apple, Google, and Samsung benefited from double-digit percentage point increases in brand value since last year's survey, with stalwart Apple foe Samsung posting a particularly impressive 53 percent leap to $29.5 billion. Cupertino's largest taxpayer climbed 20 percent to $104.3 billion, while Google gained 26 percent to settle at $47.3 billion. Samsung, whose brand value has climbed more than 130 percent over the last three years, sports the lowest advertising spend-to-brand value ratio. The Korean conglomerate spent just under $4.4 billion on advertising last year, approximately $149 million in advertising for every $1 million in brand value. Apple, in contrast, spent just $10 million on ads for every $1 million in brand value. Finland's Nokia and Canada's BlackBerry find their brands on a different trajectory, with the companies caught in a downward spiral after underestimating the popularity of Apple's iPhone and devices running Google's Android operating system. The brands' values have plummeted by 74 and 64 percent, respectively, in the last three years, relegating Nokia to the lists's 71st slot and dropping BlackBerry from the rankings entirely. Forbes says the rankings are calculated by a formula which includes a variable portion of the companies' trailing three-year revenues and the stocks' average price-to-earnings ratio over that same period of time. The amount of revenue in the equation is determined by how important a brand is to the success of businesses in that category— a higher proportion for luxury retailers, for example, and a lower proportion for airlines.